This morning I first noticed her paper globe nest. I guess I was looking down at my burgeoning plants and failed to register that, instead of scouting for a place, as I had assumed on seeing her from time to time, this queen wasp had chosen my polytunnel for her building site. I was thrilled and delighted to see her beautiful paper globe taking shape hanging from the central timber support about three quarters of the way along. Resisting the urge to duck every time she comes and goes, I also have a tinge of fear when she’s so close. I needn’t worry, though: it’s as if I am little more than something to fly around. She is totally focussed on her life’s work. Short of actually interfering with her, I am certain she is not bothered about my presence at all. It’s difficult to tell how long she’s been making the nest. 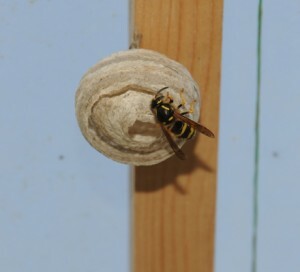 The recent warm weather has meant that the tunnel didn’t need to be closed up, even at night; so the queen wasp has been able to go in and out without hindrance for about a week. 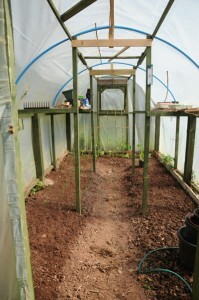 Before that, the polytunnel was opened most days and closed at night for about a fortnight. One thing is clear though – it is being built at a fast rate. When I first saw it this mid morning, it was a single sphere of translucent paper with what appeared to be a short veil above it. At the end of today, she has built the most part of a new sphere around the first one. 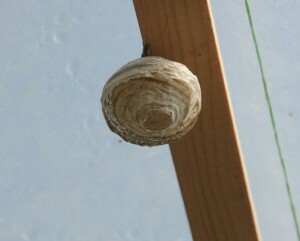 It hangs downwards from the middle timber support and has a circular opening at the bottom that is a little more across than the diameter of her body. This hole leads into the central space that houses the hexagonal cells where her offspring are growing. There appear to be seven cells, though its a bit difficult to see inside. The queen comes and goes every ten to fifteen minutes during the warm part of the day; immediately on arrival she spends a couple of minutes in the core space, apparently tending the cells. She may be feeding them, though it’s not possible to see what she’s doing. Then out she comes and gets busy building. Having done a quick check around, she chooses the place to start and works backwards anticlockwise, feeling all the while the inner globe with her middle right leg. At the same time, her middle left leg constantly feels the outside of the sphere she’s making. It seems that this is the way she keeps the structure in perfect shape. What she uses for building is a wet, quick-drying fibre that looks exactly like home made paper, which she regurgitates and moulds with her jaws. When she goes out, one of the things she does is scrape wood fibres from a board somewhere, mash it together and bring it home ready for construction work. It’s now 5.30 and she seems to have come home for the last time and is inside the inner cell space for the night. Let’s see how much she does tomorrow.